Have you ever wondered where the weird name comes from, what the site was like before it was a blog, and how it all got started? This posting has all the answers. I had been thinking about starting a website for a bit (in addition to my existing kosara.net site, which I had had since 2000). It was going to be about visualization and art. But I needed a name. I don't remember what names I had thought about at that point, and it wasn't something I was spending a lot of time on. 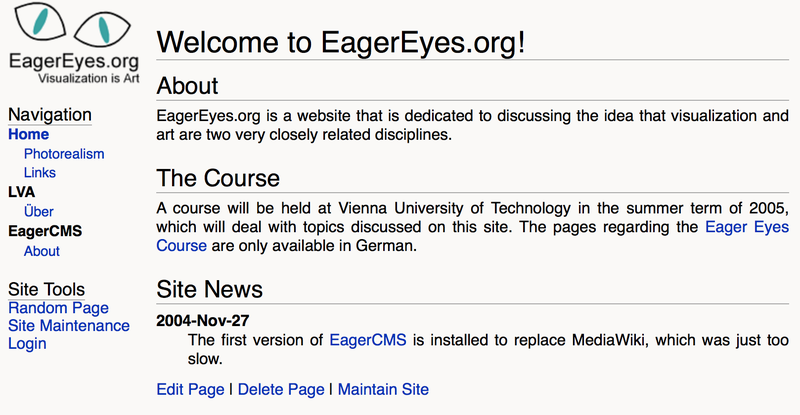 One sunny day in 2004 while I was still in Vienna – August 12, to be precise – I happened across an announcement for some sort of arts thing that was called Equal Eyes. That immediately struck a nerve, because I thought it was both clever (alliteration of sorts) and weird (why would the eyes not be equal?). Perhaps it was a pun on equalize or something, I don’t know. But it struck me as weirdly incoherent and interesting at the same time. And so as I was staring at this announcement, the name eager eyes hit me. Out of the blue. And I thought: yes, that is it! I registered the domain name right away. And the rest, as they say, is history. Every now and again, I start questioning the name. Does it sound weird? Do people cringe when they see it? But it has worked for so long that it has become my identity. So if it’s terrible, it’s kind of too late to change. It might seem like I just sat on that domain for two years, but that was not the case. I initially used it for a course I taught at Vienna University of Technology with Georg Russegger, an artist. That course was also called Eager Eyes (it was a mix of arts, photography, and visualization). The first recorded snapshot of the site on archive.org shows the page as it appeared on December 17, 2004. It was running my home-spun content management system (CMS), cleverly called EagerCMS, at the time. As you can see, I'm already complaining about MediaWiki being slow. Making the site fast was always of utmost concern to me, and partly why I started writing my own CMS. I never got very far with that, but I did think a lot about what I wanted the CMS to do and how it should work. Now that I had a domain name, I had to figure out what I was going to be. One of my early ideas was basically what Many Eyes later did: let people upload their own data and create visualizations, alongside articles about techniques etc. It didn't take very long to figure out that I had no chance of making that happen just working by myself, as a hobby. So I eventually scrapped that idea, and I was tremendously jealous when Many Eyes came out. Another idea I had was a blog-wiki hybrid. I figured it would make sense for people to be able to respond to articles with their own. Don't agree with what I write? Write a response on the site, which is automatically linked from the original article. That way, many different points of view could exist and lead to more discussion. I'm sure this would have turned into heaps of spam very quickly, but I still like that idea. In the end, I settled on the blog format, but with the goal of creating lasting content. Postings would not be tied to current events, so they would stay relevant and be useful for a long time. I kind of lost that latter part a bit over the years, which makes the recent redesign all the more important. I already mentioned writing my own CMS. I worked on that for a while, then looked at some of the available options, came back disgusted and disappointed to work some more on my own, then looked around a bit more, etc. I spent untold hours trying every CMS under the sun: typo3, Joomla (when it was still called Mambo), Drupal, plone, WordPress, a variety of wikis and bulletin board systems, etc. At the time, WordPress was absolutely terrible. It was slow, buggy, and gave you zero control over URLs. The latter was a real requirement for me, even though today nobody cares about URL structure anymore and browsers have long stopped showing you a page's path at all, displaying only the hostname. After a long, winding journey I finally settled on Drupal. That was the right decision at the time, but I also ended up tinkering way too much with it and spending time and energy trying to do lots of things that ended up not being worth it. I eventually switched to WordPress at the end of 2011. At this point, the site has spent almost half of its life on WordPress, but I have written way over half the articles in that time. Less tinkering means more writing! While I still run my own installation of WordPress on my own virtual private server (VPS), I do not recommend doing that. It takes way more time and energy than makes any sense for a blog, and you're on the hook for keeping the thing from turning into a spam or DDOS robot. My server was compromised earlier this year, which meant I had to move everything to a new instance so I could nuke the old one from orbit (the only way to be sure). Not a good use of my time. Today, the much better options are WordPress.com, Medium, or a managed WordPress installation. Rolling your own gives you control, but it also takes time away from writing. The same is true for finding the perfect CMS. Just pick either WordPress or Medium and stick with it. Don't overthink it. The content is what counts. To get the word out about my amazing new website, I did two things: write comments on other people's blogs, and print business cards! Of course, I also wrote amazing content right away. Leaving comments worked really well back in 2006 and 2007. People still read those back then and clicked on the links. It also helped with search engines. This was before all those links were marked as nofollow to discourage spam. The business cards were really helpful, too. I printed those myself, with these cards that you break apart after printing. They're surprisingly nice for what they are, and they let me print cards the day before taking off to travel to a conference (and at minimal cost). They were extremely minimal, mostly just the URL and a few words like Visualization – Criticism – Art or Visualization is Art or similar. I would just leave them on all the tables at Vis/VisWeek, and it seems that people would pick them up and check out the website. I was mostly too shy to hand them to people directly, unless I knew them. One interaction I remember in particular was with Fernanda Viégas at Vis 2006. I walked up to her and nervously handed her a business card while mumbling something about my little website. She got very excited about the name and I think she called over Martin Wattenberg to show it to him. I didn't understand what was going at the time, until the two launched the very similarly named Many Eyes a few months later. I'm sure they had the name at that point (or were mulling over different ones), so this must have resonated with them. Promoting your site is important, and I'm glad I printed those business cards. I think they really helped establish the site with the visualization community. This week has been a fantastic one for me because of all the articles you have written to explain your blogging history. I just wanted to send you a quick note to thank you for all the excellent insights you explained in these articles. There were many points that you made that I can relate to. For example, the name of my blog (3danim8) is short for three-d animate, or three-d animations, which is what I specialized in making back in the 1980’s to mid-2000’s when I was doing numerical simulation work. Most people don’t even know how to pronounce my site name until I tell them, but I use the name because things like this just have a way of sticking with you. Additionally, there were many points you made in yesterday’s article about why you write the blog. Many of those insights made perfect sense to me and I share your motivations. The real message I want to send you is this: Even though I am not a pure data vis guy, I can’t stop reading your work. Although I don’t know most of the people you talk about and I’m not as academically oriented as you are with respect to data vis, there is something about the way that you write this blog that keeps me coming back. It is hard to explain, but maybe it is the excellent writing, or maybe it is the cutting-edge you sometimes have, or maybe it is a combination of all the great things you do. Whatever the reason, I just wanted to say thanks for all the effort you go through to create this wonderful resource. I can tell you that every time a new posting notice from eagereyes hits my inbox, I click on it to see what you have to say. Considering my time constraints, what that tells me is that what you are doing is working. You’ve got me at 100%. Congratulations, and I’m looking forward to see what you do over the next 10 years.